Located between the Ligurian Apennines and the Ligurian Sea, Cogoleto in liguria, Italy, is also a part of the Monte Beigua Natural Regional Park. These days Cogoleto's residents enjoy proximity to the Monte Beigua national park. There is a copy of Domenico Colombo’s will from the sixteenth century in the city hall; Bartolomeo and Christoforo Colombo were his sons. Cogoleto’s cuisine is typical of the Ligurian Riviera. It is closely tied to the seafaring traditions which blend well with the Genoese cuisine. Some of the typical dishes are the Focaccia, Trenette with Pesto or Trofiette and Brandacujun, a main course consisting of dried cod. 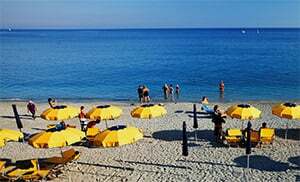 The area in which Cogoleto / Arenzano lies is, according to the ancient military schedule of Peutingeriana, actually called Hasta, where according to research studies carried out by Sir Peter Rocca at the border to Varazze exactly 20 miles to the west of Genoa there was a Roman legion. Hasta is translated as the Roman name for current. Hasta also serves as an important crossing point, because from here one comes to the Champ de Mars to the north of Varazze and then back along the coast towards Savona. There was a Roman bridge in Hasta which was destroyed by the bombardment of 21st June 1944, and a chapel called St. Maria Magdalena which is no longer existent too. The Roman street was re-discovered by the cavalier Rocca during a visit he made to the area in 1870, and this street stretched from Arenzano to Lerca, Sciarborasca and Hasta, and after the Roman bridge one came to Varazze. Cogoleto is 25 km west of Genoa; it can be accessed via the A10 or the SS1, also known as Via Aurelia.